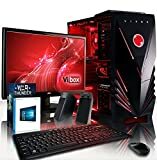 The Vibox Vision 2 really is the perfect option for anyone looking for a good, low cost, all round desktop PC with a Dual Core CPU, enhanced graphics performance, plenty of RAM and a large sized hard drive. This system’s graphics performance comes from the integrated Radeon HD8370D graphics chip that’s at its core. It is one of the best-selling chips on the market and offers users an affordable way to step onto the gaming scene, perfect for beginners who play games such as Minecraft. Although it will play some of the latest games at low frame rates, serious gamers may want to look at one of our higher end PCs for ultimate visual performance. 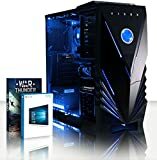 But, if you are an entry level gamer that is looking to purchase on a tight budget, then this system is the one for you. 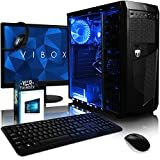 The Vibox Scope really is the perfect multimedia and gaming desktop PC for anyone looking for a low-cost system with impressive all round peformance – ideal for a family PC or casual gamer working on a budget.